Have you seen bloggers feature tweetable quotes in their posts? If they're using one of the more popular plugins, they probably look like pull quotes. Unfortunately there isn't much variation in design, and blogs using this feature have all started having their tweetable quotes look alike. That's why I previously showed you how you can add your own tweetable quotes, without a plugin, and with any design or formatting you want. But what if you don't want to go through that manual process? It turns out, you have another plugin option. 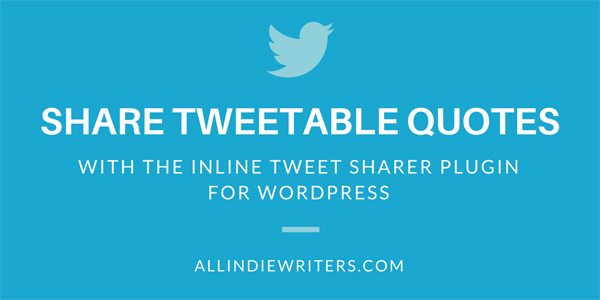 This plugin lets you share tweetable quotes without interrupting the flow of your content. And you can use CSS to format it to fit in with your site design. For example, you don't have to have a background color or the Twitter icon if you prefer a cleaner look. Inline Tweet Sharer is easy to use. There's a Twitter icon in your WordPress visual editor bar. You simply highlight the text that should become your tweet, click the bird icon, and tell the plugin if you want any extras added after someone clicks the link. You'll see three prompts pop up asking for information you'd like to add within your tweet. Remember this info counts toward your 140 characters. For example, you might add your Twitter account or a guest author's account (if yours is set up to display automatically in the plugin settings). Or you can add hashtags as a prefix or suffix. Those extras don't show up in the body of your blog post, but they do appear in the tweet when someone clicks the link. If you click the tweetable link I shared above for this post, you'll see that my Twitter handle is added when you get to preview the tweet. While the plugin was designed to put tweetable links right within the body of your content, there's another way you can use it. Create a list of "tweetables" at the end of your post to give readers several options in one place. Have you tried this plugin before? If so, what did you think of it? Did you customize the look of your inline tweets or did you just use the plugin out of the box? If you have any tips or stories to tell regarding the Inline Tweet Sharer plugin, you're welcome to do that in the comments below. Nice! I’ve been thinking about doing this for a while, but I didn’t like the look of other plugins & didn’t want to take the time to do it manually. This plugin looks great – going to try it out now 🙂 Thanks for sharing! Thanks for the tip! I like to include tweetable quotes and use Click to Tweet, but I’ll try this too. Thanks for featuring Inline Tweet Sharer on your blog :).